Event – 8 p.m. – 1:30 a.m.
Ben Flax is BACK! and ready to move crowds with a premiere performance of an all original set of new music, featuring some memorable tunes from his time with Lord Loves a Working Man, as well as a gritty and hopeful foray into new territory. Ben was inspired and encouraged to start this project by the brothers King, John and Paris, his childhood friends and superlative musicians themselves. 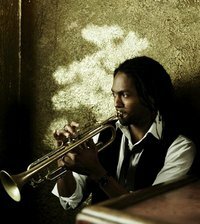 This set has deep roots in classic soul, gospel, and Jazz; but with eyes towards future shapes of music. The patron saints of the evening, sly, curtis, albert and shuggie, will have their most contemporary echoes honored, bumped and ground. When a wee 9 year old Ben first dug up Albert King’s “The Pinch” from a dusty box, he knew something was changing for him permanently – and it wasn’t just the big satin booty on the cover. He quickly fell in love with the dirty blues. Since then, he’s performed internationally, co-founding Rococo Risque, touring with Lord Loves a Working Man, and appearing at venues from the Odeon and Amnesia to YBCA and the Lang Kwai Fong Amphitheater in Hong Kong. Winner of the SFWeekly Music awards Best Soul act of SF ’08! Homegrown and haunting, Kelly McFarling’s voice spirals powerfully over a bed of oldtimey instrumentation. She is from Atlanta GA, where she learned to sing in church choirs and baseball stadiums, and she learned to write from the stories of Flannery O’ Conner and Toni Morrison. She has since wandered out to the West coast where she can be found in the back rooms of San Francisco bars Banjo plucking and singing Siren songs dubbed ‘original rhythm and bluegrass.’ Her music is inspired by hard truths and transitions with bold honest lyrics and sophisticated melodies that remain with you long after the song if over. Mcfarling’s outgoing and adventurous spirit comes through in her lyrics, her live performances, and in the music’s indulgence in elements outside its clear influences of country, oldtime, folk and blues. Using a melodic and percussive clawhammer banjo to accompany her rich powerful vocals, she pays homage to her southern roots while giving them a new home in her original sound. Her live shows are versatile and have earned her a loyal and rapidly growing fan base in the San Francisco Bay Area. She performs in intimate solo house concerts, and fills rock clubs with the big sound of her four -piece band, featuring rich upright bass, soulful sliding guitar and perfectly placed percussion. Songs to be taken whole heartedly, preferably outside of the shirt on sleeves The grass is blue, the moon is shiny. Drink up Darlin, its homebrew. 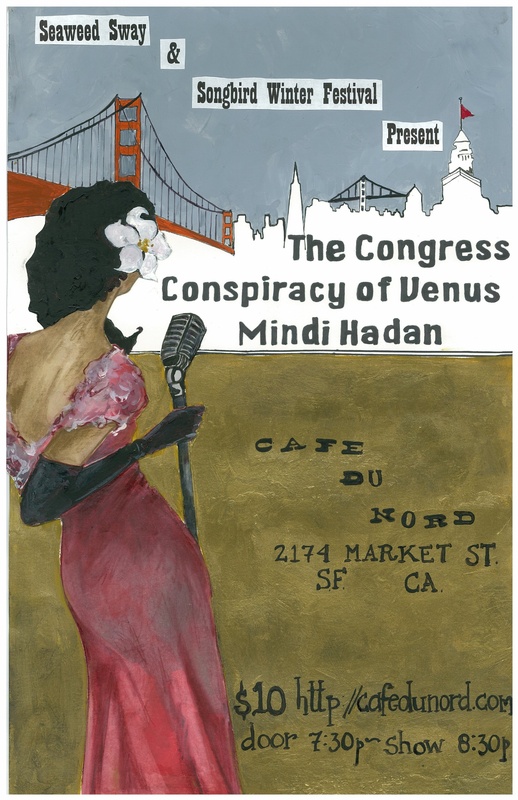 Conspiracy of Venus (CoV) is a women’s community a cappella group based in San Francisco. Under the artistic direction of Joyce Todd McBride, the 40 women of CoV interpret McBride’s daring and inventive arrangements of songs ranging from the classic (Joni Mitchell’s Big Yellow Taxi) to the cutting edge (Bjork’s Possibly Maybe) with dazzling technical verve and tons of personality. The group’s repertoire also includes works by Bill Withers, Rufus Wainwright, Tom Waits, Leonard Cohen, and Roger Miller. Conspiracy of Venus has played to sold out crowds at many San Francisco venues, including The Great American Music Hall, The Palace of Fine Arts, The Independent, The Swedish American Hall, The Rickshaw Stop, The Make-Out Room, and others, sharing bills with the Mother Hips, Or, the Whale, John Vanderslice, The Mountain Goats, Blame Sally, Emily Jane White, and Rupa and the April Fishes, to name a few. The choir is active in community service. They have performed at Dublin State Correctional Facility and played benefits for the Awamaki Peruvian Women’s Weaving Collective, The Gulabi Gang, The Ursa Freedom project, In Search of Good Food, and the Fairmount Elementary FestiVal. Wherever the group performs, Conspiracy of Venus is hailed by audiences as a groundbreaking musical experience. MINDI HADAN, a rising star on the San Francisco music scene, has been playing to Standing Room Only audiences at the popular nightclub, “Jazz At Pearl’s” with her unique blend of R & B influenced, country flavored, jazz standards. Born in Nebraska and raised in Texas, Mindi had a true musical education from the Heartland. The youngest of eight children, Mindi grew up singing in the church choir. She spent every Sunday night watching Lawrence Welk, which lead to forming an Acapella four part harmony singing group with her sisters. During these formative years, Mindi’s mother introduced her to Big Band music, Polkas and Yodeling. A turning point of “living in the sticks” was when Mindi discovered the discount cassette bin at the local gas station with $1.99 collections of Patsy Cline, Connie Francis, Judy Garland, and surprisingly, Marilyn Monroe. This eclectic treasure chest was the beginning of Mindi’s musical alchemy of combining styles and bringing new interpretations to vintage classics. Music To Freak To is a monthly Saturday Night concert at Amnesia, featuring the best in the Bay Area’s soul, funk, blues, roots, folk, rock and more! 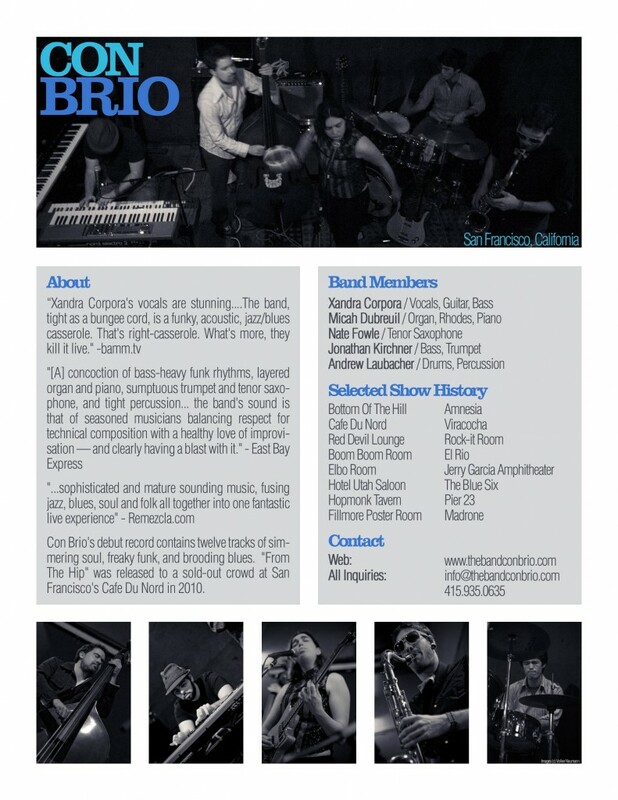 To support Con Brio’s release of their debut album “From The Hip”, the band played a veritable headlining tour of San Francisco in 2010, with spots at Bottom of the Hill, Cafe Du Nord, Red Devil Lounge, Boom Boom Room, Elbo Room, Amnesia and many more. For 2011, they plan to settle into a 4-month long residency at the hippest spot in the Mission, and have teamed with the Songbird Festival to put together a series of concerts to showcase the best emerging artists in the Bay Area and beyond. 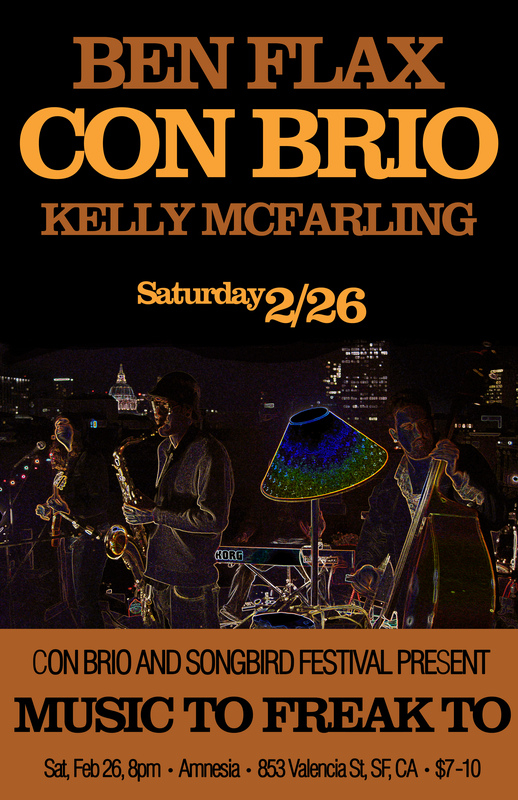 With a rotating cast of local musicians sitting in on Con Brio’s sets, and talented and diverse opening and closing acts each night, you will never know exactly what to expect at this party.